This spurred end-scraper was found sometime in the late 1970's by Bob Bostrom while surface collecting on the Bostrom Clovis camp site. 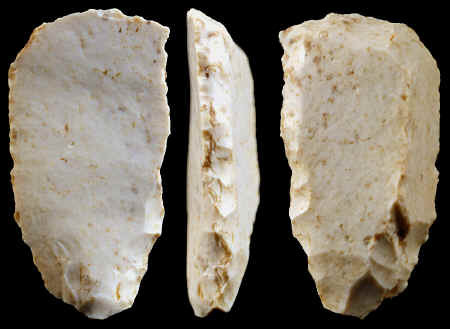 These simple tool forms are commonly found on most Clovis sites. They represent an important part of the Clovis tool kit. These small stone tools may have been hafted onto short handles similar to examples found on some Eskimo sites. A large percentage of Clovis end-scrapers have spurs. The example illustrated here has one spur. End-scrapers are a product of core and blade technology. This end-scraper was made on a thick core blade that was pressure flaked into its triangular shape. 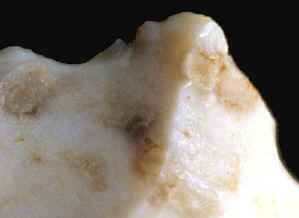 Spurred end-scrapers were probably used to scrape various types of organic materials such as animal hide, antler, bone, ivory or wood. The spurred corners may also have been used to engrave or cut similar types of materials. This spurred end-scraper is made of Burlington chert and measures 1 7/8 inches (4.7 cm) long. The above picture shows three views of a spurred end-scraper. It was made from a thick blade that was struck from a prepared core. The bulb of percussion is located at the narrow end of the blade. At least one previous blade removal scar can be seen on the surface. 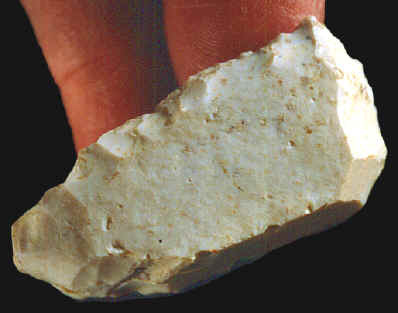 Manufacturing stone tools with core and blade technology is a signature of the Clovis culture.